In the last blog entry we looked at building out our order of battle for the 6. 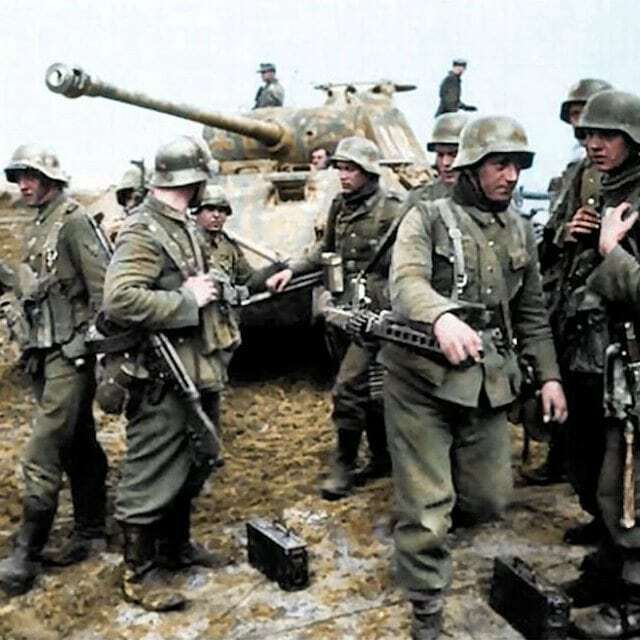 Panzer Divisions Artillery Regiment using the kriegsgliederung and the KsTNs. 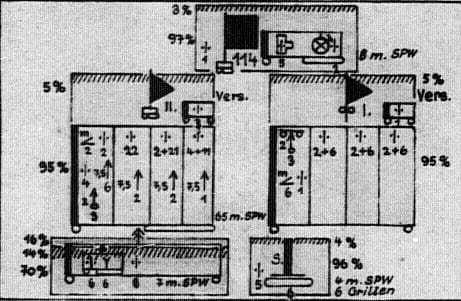 Now let us look at the kriegsgliederung schematic for the armored panzergrenadier battalion. For the 6. Panzer-Division this unit was the II./Panzergrenadier-Regiment 114. Let’s explain the symbols used in this schematic. The four (4) boxes in each battalion symbol represents the 4 companies in the battalion. The two circles under the 1st battalion indicates it is motorized. The halftrack symbol under the 2nd battalion indicates it is mounted in halftracks. The upper symbol in the company box in the 2nd battalion indicates machineguns and the quantity of 4 heavy and 11 light. The lower symbol indicates 7.5cm gun with a quantity of 1. 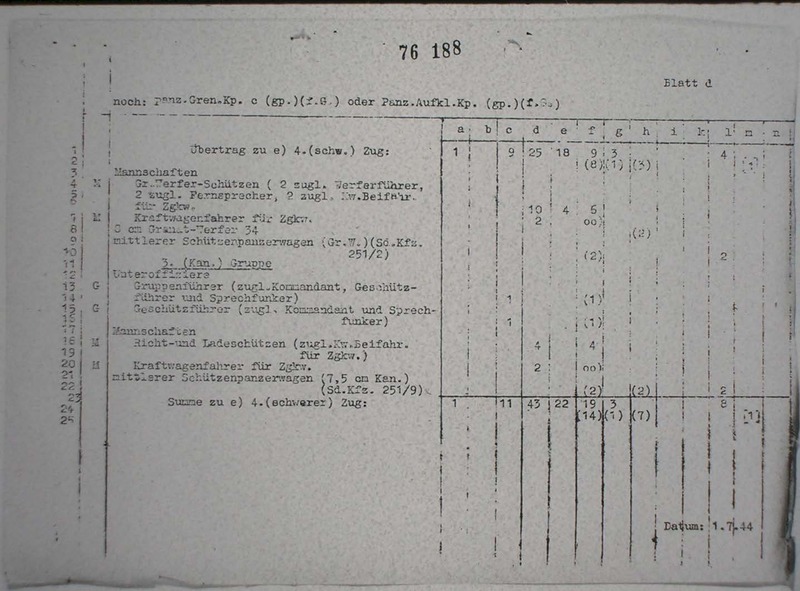 The number in the lower right outside of the company box indicates there were 65 medium halftracks (SPWs) in the unit. The 4th box to the left is the heavy weapons (schwere) company. The symbols from upper left are, 2 medium mortars (8cm) with 2 light machineguns, 6 7.5cm guns with 4 light machineguns, and 3 2cm flak guns. All of these are halftrack units. Located below the battalions are the 9th and 10th companies. The 9th company is the s.IG or heavy infantry gun company. It has 6 Grille 1.5 cm self-propelled vehicles. (6 Grillen to the lower right). The 10th company is the pioneer company which has 6 light machine guns and 6 flamethrowers (Y symbol) and they are mounted in 7 medium SPWs. The companies in these battalions are not quite at TO&E strength as we shall see next as we look at the official KStNs. We will now look in depth at the panzergrenadier company KStN 1114c (gp)(fG) which represent the first three companies in the battalion. Although we do not include the company HQ in our OOB we will look at that component first. The company command is in line 2 with the staff and manpower listed in lines 4 to 19. 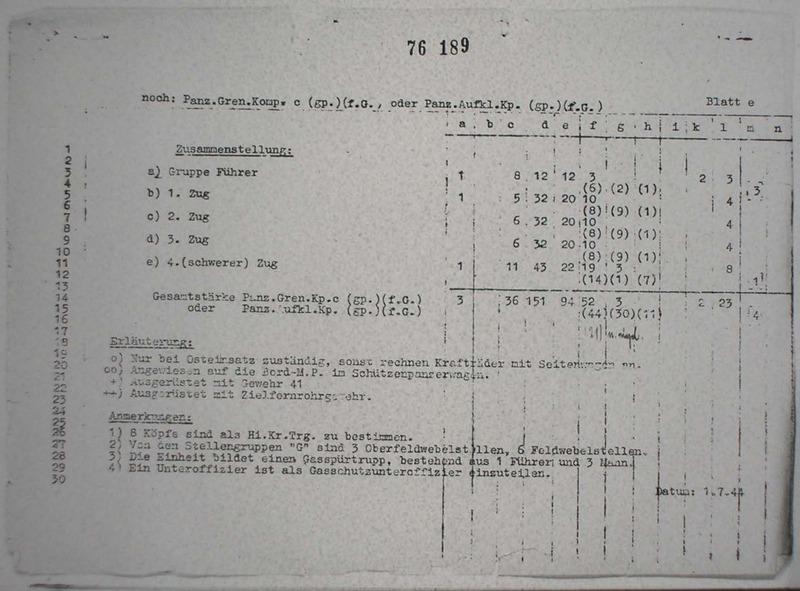 Line 20 indicates there are 3 kettenkrads (halftrack motorcycles), and line 21 lists 2 personnel cars (shwimmwagens). On the next page (see below), line 3 lists 2 251/3 SPWs (radio halftracks, and line 4 indicates 1 2cm 251/17 SPW (AAMG halftrack). 1 officer, 8 NCOs, 12 men, with 12 rifles, 3 pistols, 6 machinepistols, 2 light machineguns, 2 personnel cars, 2 Sd.Kfz. 251/3, 1 Sd.Kfz. 251/17, and 3 kettenkrads. 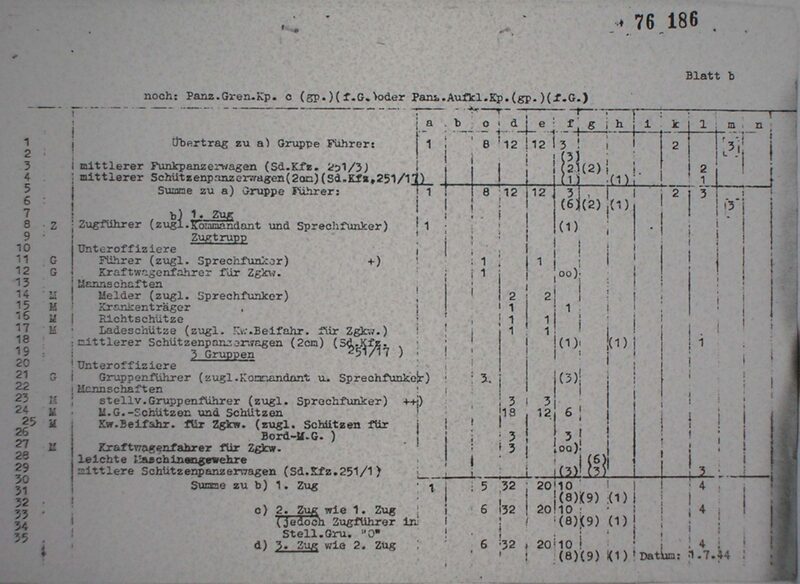 This page list the manpower and equipment for the first 3 platoons (zug) in the company. 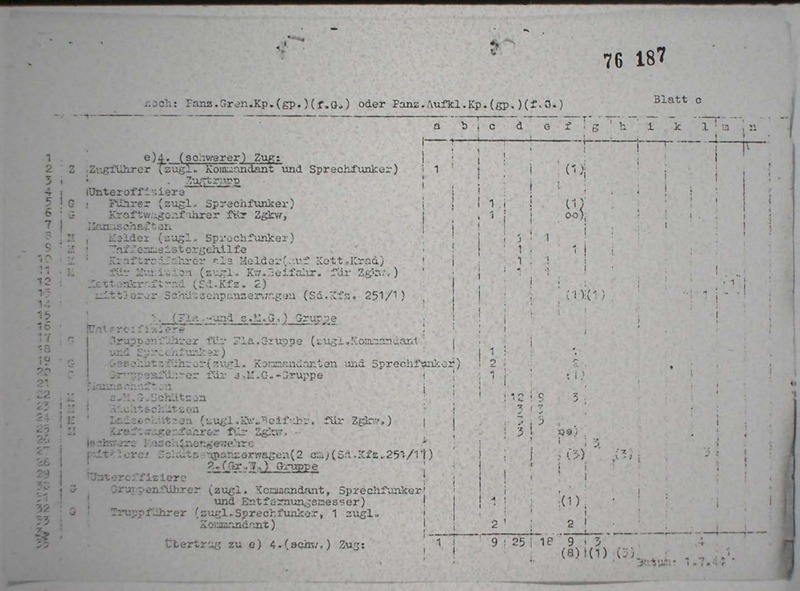 Line 8 lists the platoon commander (Zugfuhrer) while lines 10 to 17 lists the staff for a total of 8 men, mounted in a 2cm 251.17 SPW (most likely they were mounted in a 251/1 SPW). 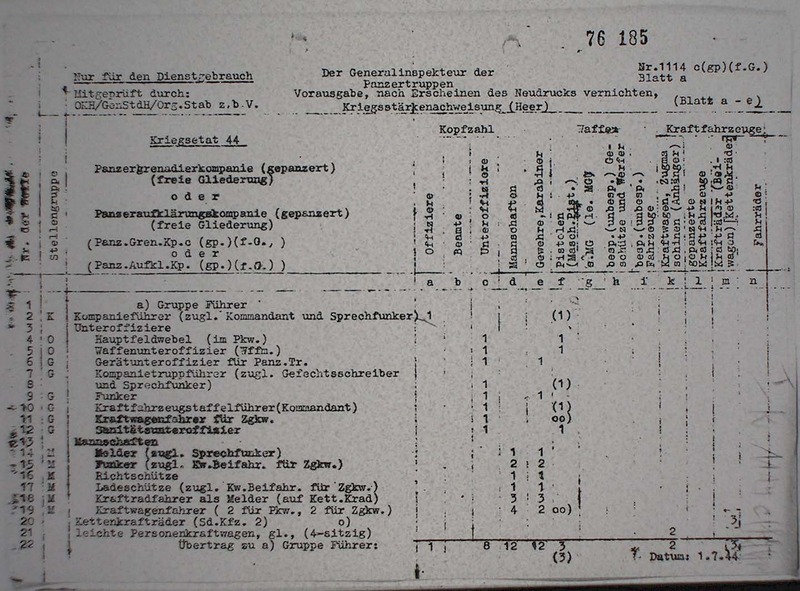 Lines 19 through 27 indicates the three squads in the platoon (3 gruppen) with a total of 30 men (10 per squad), with 6 light machineguns. They are mounted in 3 251/1 SPWs. The total for the platoon (line 30) is 38 men. 1, officer (1st platoon only), 5 NCOs (6 in 2nd and 3rd platoon), 32 men, with 20 rifles, 10, pistols, 8 machinepistols, 9 light machineguns, 4 Sd.Kfz. 251/1 SPWs. Lines 33 and 35 indicated the same totals for the 2nd and 3rd platoons. The 4. schwere platoon has three gruppen (squads). The first is the Flak and sMG Gruppe with 3 heavy machineguns (line 36) and 3 2cm 251/17 SPWs (line 27) with a total of 4 NCOs, 21 men (lines 18 to 25). The second is the Gr.W. (mortar) Gruppe with 3 NCOs and 12 men mounted in 2 8cm 251/2 SPWs (line 9). The third is the Kannon Gruppe with 2 NCOs, 6 men mounted in 2 7.5cm 251/9 SPWs (line 22). 1 officer, 11 NCOs, 43 men, with 22 rifles, 19 pistols, 14 machinepistols, 3 heavy machineguns, 1 light machinegun, 1 Sd.Kfz. 251/1 SPW, 3 2cm Sd.Kfz. 251/17 SPW, 2 8cm Sd.Kfz. 251/2 SPW, 2 7.5cm Sd.Kfz. 251/9 SPW. 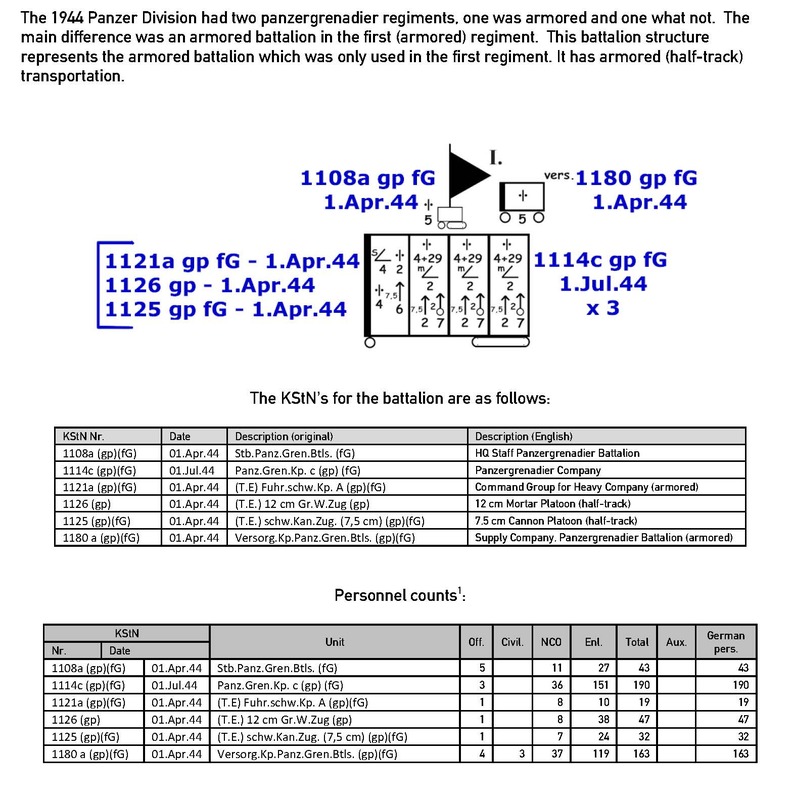 The next page shows us a complete summary of the Gruppe leader and all 4 platoons with manpower and weapons. With all in information acquired from the KsTN, we can now start creating our OOB for the 5 to 7 companies in the II./PzGr-Regt 114. The first 3 platoons are filled out with 38 men as listed in the KsTN. The 4. or heavy platoon shows the 3 gruppen (squads) with the HMG (251-17), mortar (251-2), and the 7.5cm artillery (251-9). As shown in the beginning of this blog in the kreigsgliederung, this unit is missing the HMG and mortars in the 4th platoon. These units would be deleted in the Scenario Editor to indicate present unit strength. I hope these past two blogs have shown you how to create a historical German order of battle. As I have stated this can only be done accurately if you have the data necessary. Many times all this information will not be available and you have to create your full TO&E OOB and make educated guesses as to the present unit strength in the Scenario Editor. In the next blog we will begin to explore the Soviets and all the necessary information needed to create an order of battle for them.